It’s easy to see why studios are drawn to stories like the one behind “The Finest Hours,” where four Cape Cod Coast Guardsmen braved impossible weather to rescue the 33 men trapped on a severed oil tanker. By all rights, every one of them should have died a cold, miserable death that night in early 1952, but they didn’t, and it is still considered one of the greatest rescues in Coast Guard history, which is why someone thought, “We should make a film about this.” That in itself is not a bad idea. The bad idea is when the film they make about this incredible story looks like every other film ever made about a similar story. This is a pity; the water sequences are breathtaking, but it’s hard to get emotionally invested in any of the characters, not for a lack of effort on Casey Affleck’s part. 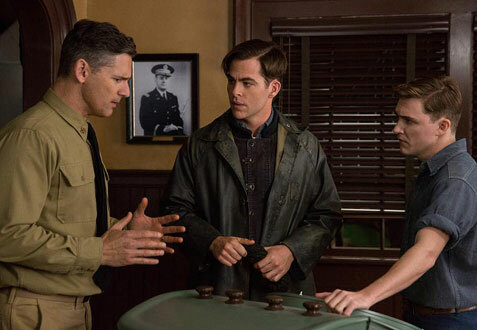 Coast Guard Boatswain Mate First Class Bernie Webber (Chris Pine) is about to meet, for the first time, the girl he has spent the last four weeks talking on the phone. He’s nervous about how she’ll feel about him, even though a) she’s taken his calls for four weeks, and b) he looks like Chris Pine. The girl, Miriam (Holliday Grainger), likes him just fine, and a few months later, unsung feminist pioneer Miriam asks Bernie if he’ll marry her. Almost immediately after he says yes (in the most awkward, bumbling manner possible), Miriam gets a taste of life as the wife of a Guardsman. A nasty Nor’easter splits two oil tankers in half off the Massachusetts coast. Bernie, who works in nearby Chatham Station on Cape Cod, is instructed to look for the SS Pendleton, even though there has been no contact from the Pendleton, the Chatham office only has an educated guess where the Pendleton is due to a malfunctioning radar, and there’s a good chance that Bernie’s crew will get stranded on a sand bar before reaching the deep blue sea. The de facto captain of the Pendleton is Ray Sybert (Affleck), an unpopular engine room lifer who knows the ship better than anyone on board, and must convince the crew that he can lead them, or at least keep them alive the longest. For those who wish to debate the authenticity of the Boston accents: don’t. Just don’t, please. The actors are trying their best to do a damn hard accent, and in the end, it has no impact on the movie’s overall quality. Heck, Casey Affleck is from Boston, and he doesn’t even use his Boston accent. That says it all, right there. But beyond that, Affleck is committed to making this movie great on a level that no one else can touch. Pine might be the headliner, but Affleck is the star. There are several familiar beats and tropes in those two synopsis paragraphs, and that is by design. The film covers the lives of over three dozen men, but the audience only gets to know one of their love interests. (To be fair, even the great “Apollo 13” is guilty of this.) There is manufactured conflict between Ray and an outspoken defeatist who dismisses everyone else’s ideas. There is the commanding officer (poor, poor Eric Bana) who lacks his subordinates’ respect and is out of his depth, but won’t admit it. Even the forthrightness of the determined Miriam feels like a cheat, even though it’s actually true to life. Heck, everything here could be exactly as it happened, but because it’s been done so many times before, it feels fake. And then they cut back to the ocean, and the movie comes to life. The interior shots of the SS Pendleton falling apart are nerve-racking, but it’s the underwater shots that make the biggest impact, because they manage to create the effect of underwater currents, something that is difficult to do on the movie studio water tank stage. (There is also one bone-chilling underwater shot of the SS Pendleton’s sole casualty.) Bernie’s crew starred in some equally impressive technical achievements, as their relatively puny boat ascended wave after wave that were just a notch below the big one in “The Perfect Storm.” And sometimes, they didn’t ascend them, and still somehow carried on. How the Guardsmen didn’t all die of hypothermia shortly after reaching land is astounding. 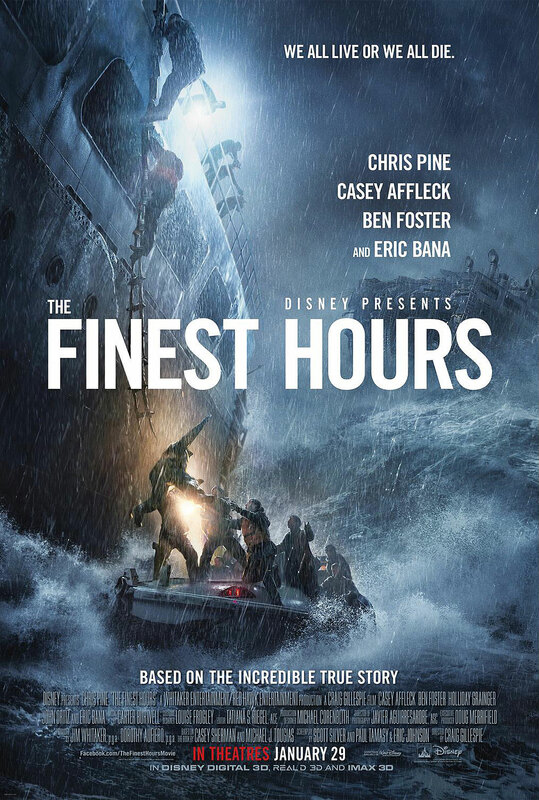 Hats off to “The Finest Hours” for documenting a decades-old act of brazen selflessness that deserves to live forever. Hats back on for making the same damn rescue movie that has been made dozens of times before. If this is indeed one of the greatest rescues in Coast Guard history, then its cinematic equivalent deserves the same.